The Sura BungalowsThe 2-star The Sura Bungalows offers comfort and convinience whether you’re on business or holiday in Bali. The hotel offers a wide range of amenities and perks to ensure you have a great time. Laundry service/dry cleaning, Wi-Fi in public areas, airport transfer, safety deposit boxes, car park are on the list of things guests can enjoy. Guestrooms are fitted with all the amenities you need for a good night’s sleep, including internet access â wireless (complimentary), kitchenette, shower, balcony/terrace, coffee/tea maker. The hotel offers various recreational opportunities. The Sura Bungalows combines warm hospitality with a lovely ambiance to make your stay in Bali unforgettable. 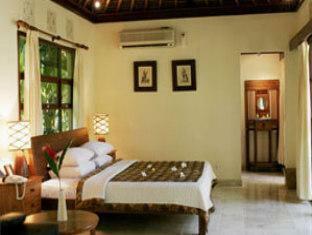 The 2-star The Sura Bungalows offers comfort and convinience whether you’re on business or holiday in Bali. The hotel offers a wide range of amenities and perks to ensure you have a great time. Laundry service/dry cleaning, Wi-Fi in public areas, airport transfer, safety deposit boxes, car park are on the list of things guests can enjoy. Guestrooms are fitted with all the amenities you need for a good night’s sleep, including internet access â wireless (complimentary), kitchenette, shower, balcony/terrace, coffee/tea maker. The hotel offers various recreational opportunities. The Sura Bungalows combines warm hospitality with a lovely ambiance to make your stay in Bali unforgettable.